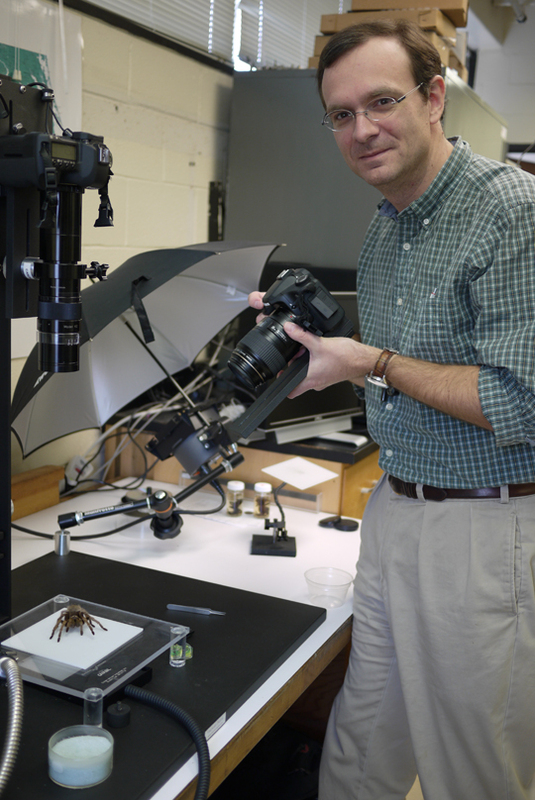 COSAM » COSAM Faculty » Biological Sciences » Bond, Jason E.
Systematics, taxonomy, and evolution of terrestrial arthropods with an emphasis on arachnids and myriapods (specifically spiders and millipedes). We employ molecular, morphological, and ecological approaches to study questions related to evolutionary diversification at multiple hierarchical levels (populations – higher taxa). Opatova V, JE Bond, M Arnedo. 2016. Uncovering the role of the Western Mediterranean tectonics in shaping the diversity and distribution of the trap-door spider genus Ummidia (Araneae, Ctenizidae). Journal of Biogeography, doi:10.1111/jbi.12838. Folt, B, N Garrison, J. Rodriguez, C Guyer, JE Bond. 2016. Phylogeography and Evolution of the Red Salamander (Pseudotriton ruber). Molecular Phylogenetics and Evolution, 98: 97-110. Hamilton CA, BE Hendrixson, JE Bond. 2016. Taxonomic revision of the tarantula genus Aphonopelma Pocock, 1901 (Araneae, Mygalomorphae, Theraphosidae) within the United States. Zookeys, 560: 1-340. http://doi.10.3987/zookeys.56.6264. Graham M, BE Hendrixson, CA Hamilton, JE Bond. 2015. Miocene extensional tectonics explain ancient patterns of diversification among turret-building tarantulas (Aphonopelma mojave group) in the Mojave and Sonoran deserts. Journal of Biogeography, 42: 1052-1065, doi: 10.1111/jbi.12494. Hendrixson BE, AV Guice, JE Bond. 2015. Integrative species delimitation and conservation of tarantulas (Araneae: Mygalomorphae: Theraphosidae) from a North American biodiversity hotspot. Insect Conservation and Diversity, 8: 120-131. doi: 10.1111/icad.12089. Bond JE, NL Garrison, CA Hamilton, RL Godwin, M Hedin, I Agnarsson. 2014. Phylogenomics: Resolves a Spider Backbone Phylogeny and Rejects a Prevailing Paradigm for Orb Web Evolution. Current Biology, 24: 1765-1771. http://dx.doi.org/10.1016/j.cub.2014.06.034. Schultheis, AS, D Nicholas, PT Justin, JE Bond, DK Shiozawa. 2014. Comparative transcriptomics allows for rapid development of population-level nuclear markers in Hesperoperla pacifica (Plecoptera: Perlidae). Freshwater Science, 33: 364-373. Bond JE, RL Godwin. 2013. Taxonomic Revision of the Trapdoor Spider Genus Eucteniza Ausserer (Araneae: Mygalomorphae: Euctenizidae). ZooKeys 356: 31–67. doi: 10.3897/zookeys.356.6227. Lamb T, Pollard R, Bond JE. 2013. Genetic variation corroborates subspecific delimitation in the Namib fog-basking beetle, Onymacris unguicularis (Haag) (Tenebrionidae, Coleoptera). ZooKeys 353: 47–60. doi: 10.3897/zookeys.353.6228. Brewer MS, JE Bond. 2013. Ordinal-Level Phylogenomics of the Arthropod Class Diplopoda (Millipedes) Based on an Analysis of 221 Nuclear Protein-Coding Loci Generated Using Next-Generation Sequence Analyses. PLoS ONE8(11): e79935. doi:10.1371/journal.pone.0079935. Opatova V, JE Bond, MA Arnedo. 2013. Ancient origins of the Mediterranean trap-door spiders of the family Ctenizidae (Araneae, Mygalomorphae). Molecular Phylogenetics and Evolution, 69: 1135-1145. doi.org/10.1016/j.ympev.2013.08.002. Brewer MS, L Swafford, CL Spruill CL, JE Bond. 2013. Arthropod Phylogenetics in Light of Three Novel Millipede (Myriapoda: Diplopoda) Mitochondrial Genomes with Comments on the Appropriateness of Mitochondrial Genome Sequence Data for Inferring Deep Level Relationships. PLoS ONE 8(7): e68005. doi:10.1371/journal.pone.0068005. Bond JE, SJ Taylor. 2013. A new species of Tarsonops (Araneae, Caponiidae) from southern Belize, with a key to the genera of the subfamily Nopinae. Zookeys, 289: 57–64.